Perfection has a different meaning to every person. For the 4 different people in this story(Kendra,Cara,Sean,Andre) each means a different thing from excelling in sports to having the perfect body and face to living up to your parents' expectations. 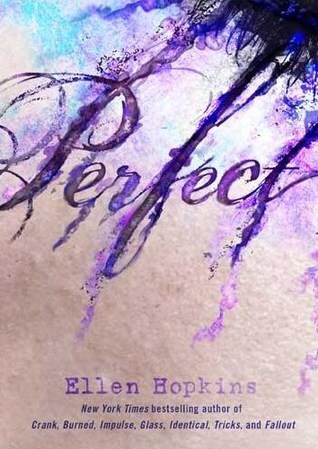 The book follows these four teens and each of their stories and how the word perfection affects them. The book is set up in a style where each chapter is a new person making it very interesting to read to see how each person's story ties into another. Why I Picked it Up: It was on my school's read for a lifetime list and the title and description just seemed so interesting. Why I Finished It: Since It was just soooo good!!! I really couldn't stop reading it! It got to a point where I would be reading till 11 at night when I should've been in bed. The book draws you in and you won't want to stop. I’d Give this Book To: Everyone!!! It's so good!! But you need to be a little mature to handle this book. **Librarian Side Note** Did you think the author's name sounds familiar? That's because I did a big blog post about Ellen Hopkins back in April during National Poetry Month! Also, don't be fooled by the number of pages in this book (640 pages!). Because it's actually poetry telling a story it's a pretty quick read.